I frequently tell people that everything is interesting and cool, and only gets more awesome the closer you look. Here’s a relentlessly deep dive into a corny song that’s over 120 years old. CAUTION: Daisy Bell (Bicycle Built for Two) is an earworm, and the insidious metaphorical kind, not the literal ones who are just trying to make a living that I like to cover on this blog. What’s that? You read the medical paper in that link and now your ears itch just thinking about it? Why watch horror movies at all when there’s all of nature’s untrammeled majesty just waiting to be discovered? Why, you’re welcome. Henry, Henry, I’ll give you my answer true. I’m not crazy all for the love of you. If you can’t afford a carriage. Heh. Read it really carefully. What’s this song about, and what’s going on? What happens in it? Don’t overthink it. I find, when teaching people to close read, they think there’s some kind of secret, super-hard trick answer to questions like this, when really, all I want is the obvious, basic stuff. Got an idea of what the song’s about? Click and drag over the following text for an overview, to check your answer: Henry proposes marriage to to Daisy, who rejects him. On the same page now, regarding the text? Good. Now, the interesting thing is, this isn’t the original version of the song at all. Turns out, the original version is this one, and it was written in 1892. Here’s a more listenable recording, from not much later. The complete soppiness of the original song drew parody second-verse replies almost instantly, and one of these became the version I know. I learned it from my mom, who learned it from her parents, who learned it from their parents, who learned it from their parents. Whoa. That brings us to official Interesting Point #1 – songs can be transmitted from generation to generation for over a century. It clearly mutated a bit along the way too. Fascinating. So, bicycle built for two, huh? Bring on Interesting Point #2 – There was a full-on bicycle fad, at the end of the 19th Century. 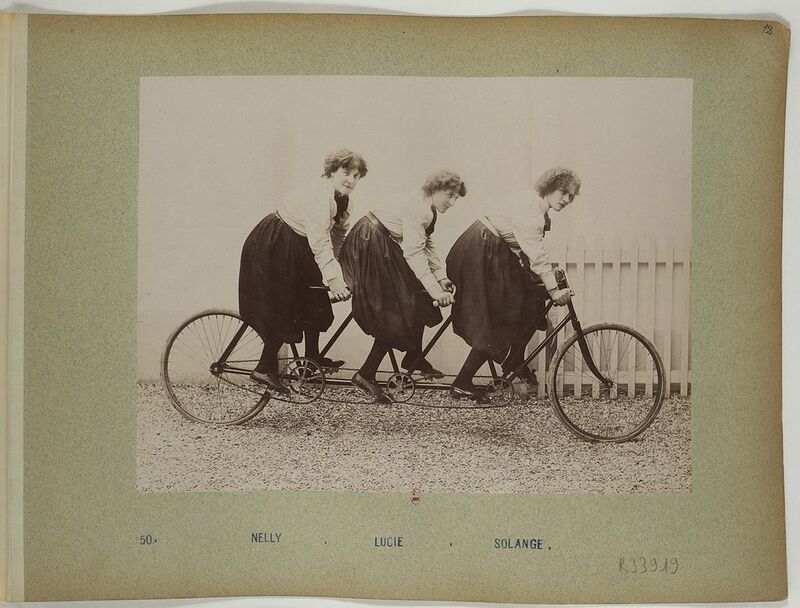 Daisy Bell was written to cash in on it while these newfangled velocipedes were all the rage. 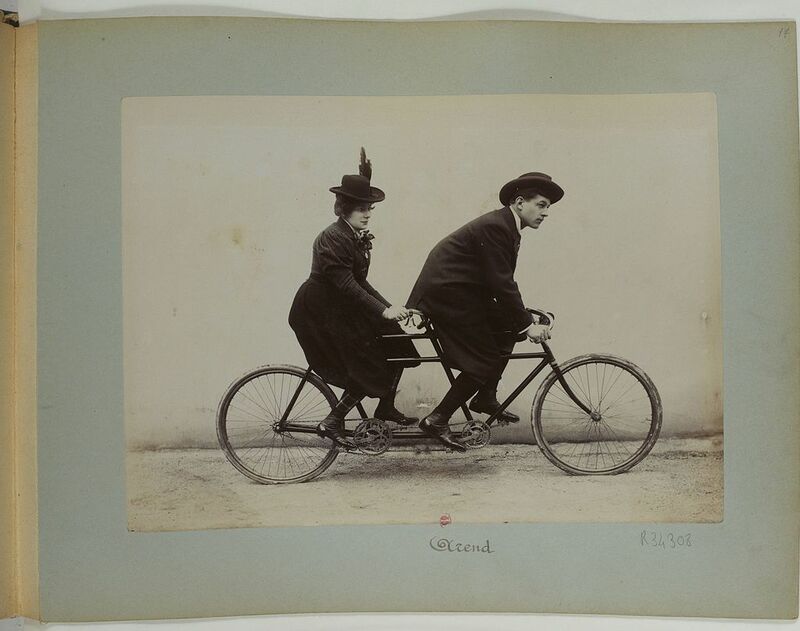 Tandem bicycles were also popular, with (according to pictures) lots of variants. 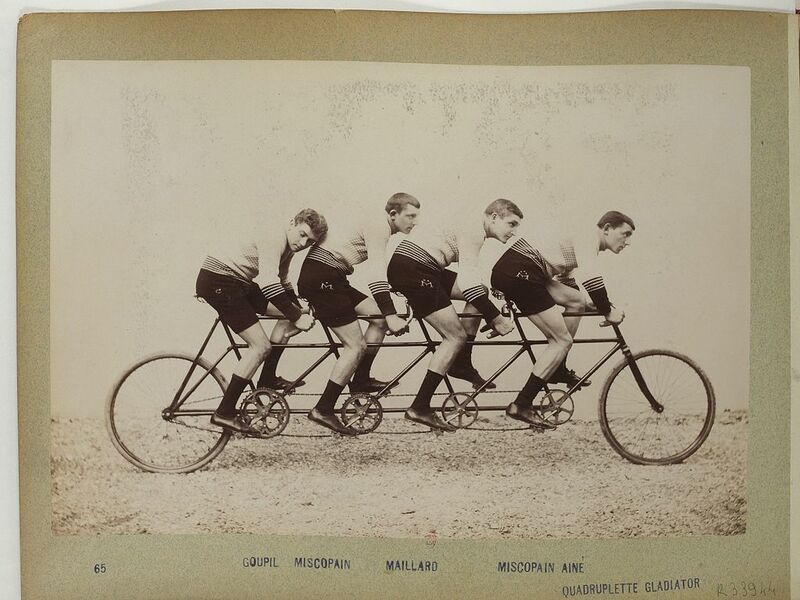 You’ve seen bicycles built for two, but how about three? Three people on a bike. Four on a bike. 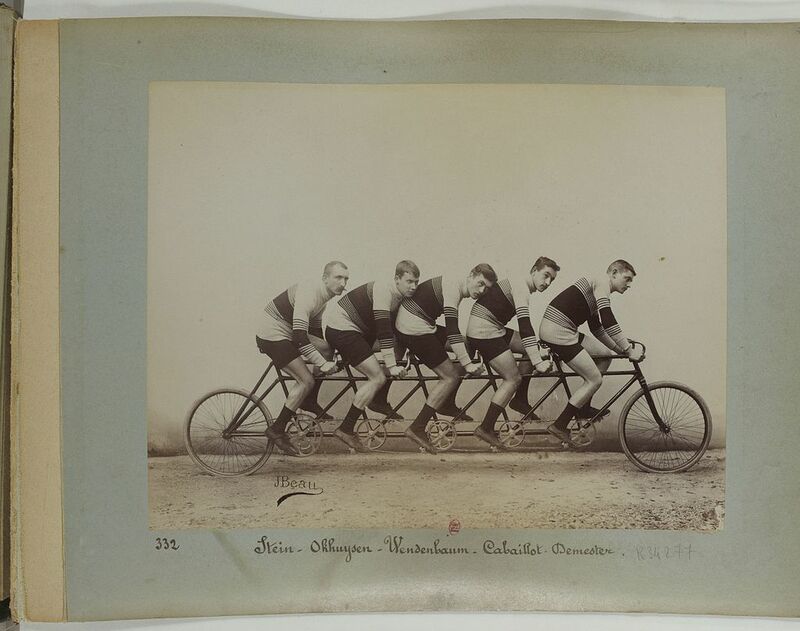 These seem to have come from the same album, so I’m guessing there were competitive sports for entire teams of people on tandem bicycles. My favorite thing about this picture is that enough time has passed that (in 2018) the haircuts are all back in fashion. Give these gents some skinny jeans and a plaid shirt and a smartphone, and you wouldn’t even look at them if you passed them on the street. Anyway, bicycle craze over, the other Interesting Point about Daisy Bell is #3 – this is the song that computers sing. If you know this song at all, it’s probably from 2001: A Space Odyssey and it was HAL 9000. Chances are really good that if you ask your voice activated digital assistant to sing their favorite song, they’ll sing this one. The reason is that the first speech synthesis program sang this as a demo on the IBM 704. Everything from the weather alert voice to Hatsune Miku and your digital assistant comes back to Daisy Bell. This entry was posted in Art and Inspiration and tagged biology, computers, History, music, technology on August 1, 2018 by Katherine.